This version is suitable when the vapour contains small amounts of inert gases. 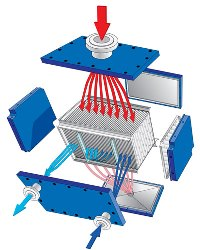 Vapour enters through the big inlet on the top panel and condenses on the plates. The condensate exits through the sloped, drainable bottom panel. The two-pass version can be used when the vapour contains a larger portion of inert gases. 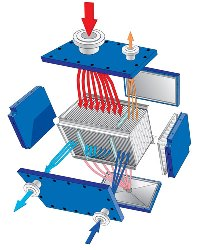 Main condensation takes place in the first pass where the condensable part of the vapour condenses on the plates before exiting through the sloped, drainable bottom panel.